Ahmadiyya (/ɑːməˈdiə/; or Qadiani officially, the Ahmadiyya Muslim Community or the Ahmadiyya Muslim Jama'at; Arabic: الجماعة الإسلامية الأحمدية‎, transliterated: al-Jamā'ah al-Islāmiyyah al-Aḥmadiyyah; Urdu: احمدیہ مسلم جماعت‎) is an Islamic revival or messianic movement founded in Punjab, British India, in the late 19th century. It originated with the life and teachings of Mirza Ghulam Ahmad (1835–1908), who claimed to have been divinely appointed as both the promised Mahdi (Guided One) and Messiah expected by Muslims to appear towards the end times and bring about, by peaceful means, the final triumph of Islam; as well as to embody, in this capacity, the expected eschatological figure of other major religious traditions. Adherents of the Ahmadiyya—a term adopted expressly in reference to Muhammad's alternative name Aḥmad—are known as Ahmadi Muslims or simply Ahmadis. The population is almost entirely contained in the single, highly organized and united movement. However, in the early history of the Community, a number of Ahmadis broke away over the nature of Ahmad's prophetic status and succession and formed the Lahore Ahmadiyya Movement for the Propagation of Islam, which today represents a small fraction of all Ahmadis. Some Ahmadiyya-specific beliefs have been thought of as opposed to current conceptions of Islamic orthodoxy since the movement's birth, and some Ahmadis have subsequently faced persecution. Many Muslims consider Ahmadi Muslims as either kafirs or heretics, an animosity sometimes resulting in murder. The Ahmadiyya faith claims to represent the latter-day revival of the religion of Islam. Overseas Ahmadiyya missionary activities started at an organized level as early as 1913 (for example, the UK mission in Putney, London). For many modern nations of the world, the Ahmadiyya movement was their first contact with the proclaimants from the Muslim world. The Ahmadiyya movement is considered by some historians as one of the precursors to the Civil Rights Movement in America. According to some experts, Ahmadiyya were "arguably the most influential community in African-American Islam" until the 1950s. Today, the Ahmadiyya Muslim Community has one of the most active missionary programs in the world. It is particularly large in Africa. In the post colonial era, the Community is cred for much of the spread of Islam in the continent. During his time, missions were established in 46 countries, mosques were constructed in many foreign countries and the Quran published in several major languages of the world. Although the Community continued to expand in the course of succeeding Caliphates, sometimes at a faster pace, the second caliph is cred for much of its inception. 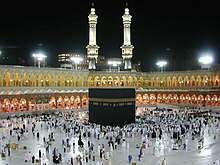 Ahmad wrote many written works, the most significant of which is the ten volume commentary of the Quran. Elected on 8 November 1965, Mirza Nasir Ahmad succeeded as the third Caliph of the Ahmadiyya Muslim Community. Started by his predecessor, he is cred with the expansion of the missionary work, particularly in Africa, and is seen as having shown great leadership and guidance to the Community during the period when the National Assembly of Pakistan declared the Community as a non-Muslim minority. Nusrat Jahan Scheme, a scheme dedicated to serving parts of Africa by running numerous medical clinics and schools was one of the many outcomes of his 1970 tour of West Africa, regarded as the first ever visit to the continent made by an Ahmadi Caliph. During his visit for the foundation stone ceremony of the Basharat Mosque, the first mosque in modern Spain, he coined the popular Ahmadiyya motto: Love for all, Hatred for None. 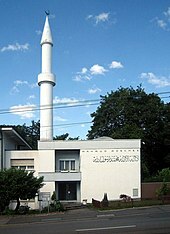 Wikimedia Commons has media related to Ahmadiyya.